The Ghost Inside took home Most Dedicated Fanbase at the 2016 Alternative Press Music Awards. This comes nearly eight months after their involvement in a tragic bus accident that claimed the lives of two drivers and left the band members with extensive roads to recovery. A heartfelt acceptance speech left the entire scene showing their support for the band. Below are a few comments from various members of bands from all across our scene. So proud of @theghostinside on their win tonight. 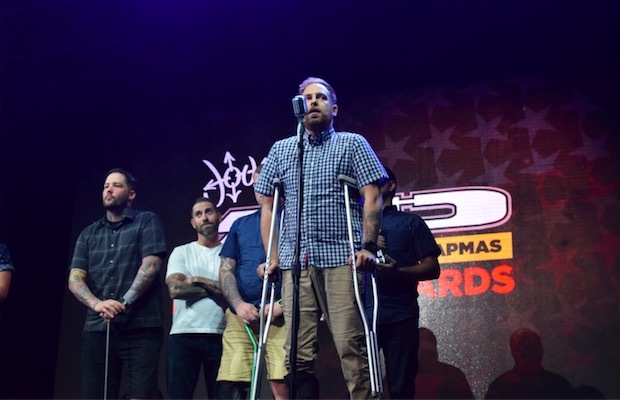 Seeing them all together on stage again was the highlight of my year.
. @theghostinside wins the APMAs. Inspiring. Got pretty emotional tonight seeing @theghostinside @JonathanVigil standing tall tonight as one accepting their award. #TGIForever.